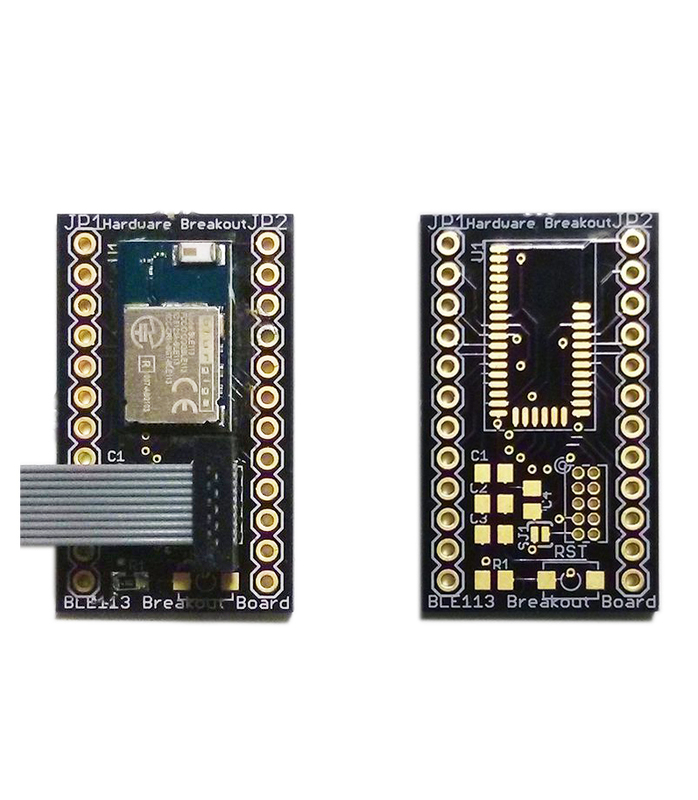 This is a bluetooth breakout board for Silicon Lab’s Bluetooth Low Energy module, the BLE113. Each pin is broken out on standard .1″ headers for easy breadboarding. It also has custom firmware provided by Silicon Lab’s to make development easier than ever. Not only does their software allow the module to be completely controlled via an external microcontroller or computer, but it allows simple custom firmware development. You can easily create custom scripts (which you need the CC Debugger to program) to interface with the on board ADC, timers, and more! The BLE113 is both smaller and consumes less power than the popular BLE112. While the BLE113 is more difficult to solder, it is desirable for applications where size and power are a constraint. Additionally, the BLE112 contains an integrated USB peripheral while the BLE113 contains an I2C peripheral. 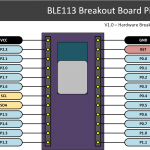 This breakout board is built around the BLE113-A-M256K, a version of the BLE113 module with 256KB of internal flash. As part of the Bluetooth 4.0 standard, Bluetooth Low Energy (BLE) enables ultra-low power, Bluetooth compatible devices (also known as Bluetooth Smart Devices). There are many amazing aspects of BLE. Check out the Silicon Lab’s site for more information on what you can do with custom firmware. They provide example projects and great documentation. You just need to register for access to their technical support. The first option is a blank PCB which does not contain any components; all you receive is a blank PCB. The second option is for an assembled PCB with stock firmware. This option comes with an assembled PCB (module, switch, and passives soldered onto the PCB) and contains no special firmware. Breakaway headers are included but not soldered to the board. The firmware which comes default on the module (as if you bought it directly from Mouser), does not allow for any advanced functionality. Only choose this option if you have a TI CC Debugger. We will be happy to program the BLE Breakout Board for you if you provide us with the firmware within 24 hours of placing your order. Please contact us for details. IMPORTANT: YOU NEED TO HAVE A CC DEBUGGER FROM TEXAS INSTRUMENTS IN ORDER TO PROGRAM THE BLE113 MODULE! THIS CAN BE DONE USING THE ON-BOARD PROGRAMMING HEADER. If we are out of stock, please feel free to pre-order a board. It will be shipped out as soon as possible.